26th Oct 2018 shall remain imprinted in the memories of kids and adults of Team DoaR who got chance to visit the temple of our democracy "Bhartiya Sansad". This provided a unique opportunity to the to the children and big ones to a close look at the place where all started, the paper of independence exchanged hands and where all the life-impacting decisions are being made. It was a mesmerizing moment to be in the central hall and watching to the iconic chair and fans. You can leave the building but the building does not leave you. Due to security restrictions, we were not allowed to capture the moments of our life inside the building, however, tried to take a customary photo with the group from outside. 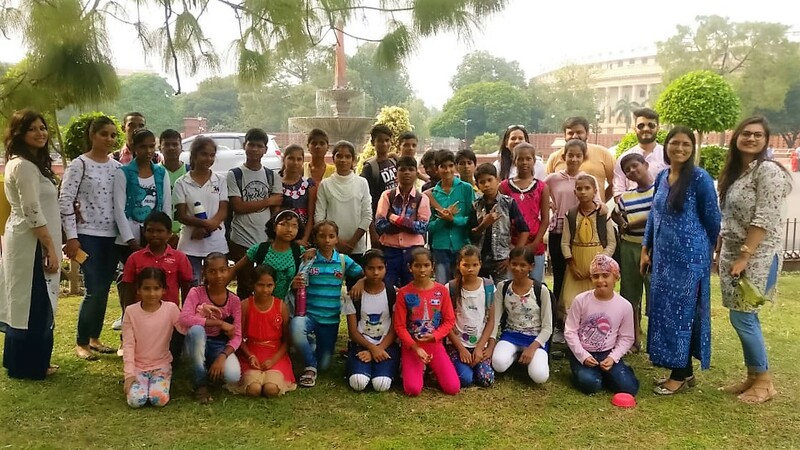 30 students from various centres ( sec 45, sec 43, sec 5 and Sec 48 ) participated along with the volunteers- Pooja Yadav, Arpita Sharma, Krishna Chandak, Sandeep, Rajak, Anjali and Kiran who managed the transportation to made this trip possible. Special thanks to Manvinder who managed all the arrangements with the govt authorities and other necessary approvals.